The literature on biological effects of magnetic and electromagnetic fields commonly utilized in magnetic resonance imaging systems is surveyed here. After an introduction on the basic principles of magnetic resonance imaging and the electric and magnetic properties of biological tissues, the basic phenomena to understand the bio-effects are described in classical terms. Values of field strengths and frequencies commonly utilized in these diagnostic systems are reported in order to allow the integration of the specific literature on the bio-effects produced by magnetic resonance systems with the vast literature concerning the bio-effects produced by electromagnetic fields. This work gives an overview of the findings about the safety concerns of exposure to static magnetic fields, radio-frequency fields, and time varying magnetic field gradients, focusing primarily on the physics of the interactions between these electromagnetic fields and biological matter. The scientific literature is summarized, integrated, and critically analyzed with the help of authoritative reviews by recognized experts, international safety guidelines are also cited. Safety issues and discussions about potential hazards associated with magnetic resonance imaging (MRI) systems and procedures have been extremely controversial over the past decade: partly because of the disputed assertions about the role of electromagnetic fields in carcinogenesis or the promotion of abnormalities in growth and development [1–3]; partly because the assumption that MRI was inherently a safe procedure had reduced the importance of the publication of negative results . Since the introduction of MRI as a clinical modality in the early 1980s, more than 100,000,000 diagnostic procedures (estimated) have been completed worldwide, with relatively few major incidents [5, 6]. Most reported cases of MRI related injuries have been caused by misinformation related to the MR safety aspects of metallic objects, implants, and biomedical devices [7, 8]. In fact, the MR environment may be unsafe for patients with certain implants, primarily due to movement or dislodgment of objects made from ferromagnetic materials , but also because of heating and induction of electrical currents, which may present risks to patients with implants or external devices . These safety problems are typically associated with implants that have elongated configurations or that are electronically activated (e.g. neurostimulation systems, cardiac pacemakers, etc.). In the MR environment, magnetic field-related translational attraction and torque may cause hazards to patients and individuals with such implants. The risks are proportional to the strength of the static magnetic field, the strength of the spatial gradient, the mass of the object, its shape and its magnetic susceptibility. Furthermore, the intended in vivo use of the implant or device must be taken into consideration because existing counteracting forces may be present that effectively prevent movement or dislodgment of the object. To date, more than one thousand implants and objects have been tested for MR safety or compatibility. This information is readily available to MR healthcare professionals, though it requires heightened awareness by the MR community to continually review and update their policies and procedures pertaining to MR safety based on the information in the relevant medical literature . Physicians are aware of the absolute contraindications to MRI with regard to implantable devices, less familiar is the potential for an MRI-induced thermal or electrical burn associated with induced currents in conductors in contact with the patient's body. Although detailed studies concerning the burn hazard in MRI have not yet been reported, recent reports have, however, indicated that direct electromagnetic induction in looped cables in contact with the patient may be responsible for excessive heating [12–14]. A comprehensive presentation and discussion of MR related hazardous effects is beyond the scope of this review, thus we will limit the discussion to bio-effects produced by MRI systems acting directly on the human body. Several research studies have been conducted over the past thirty years in order to assess the potential dangerous bio-effects associated with exposure to MRI diagnostics. Because of the complexity and importance of this issue, most of these works are dedicated to separately examining biological effects produced by a particular magnetic or electromagnetic field source utilized in MRI. Moreover, the scientific literature proliferates in an ever-increasing number of studies concerning biological effects produced by the interactions of biological matter with electromagnetic fields. Thus, there is a need to integrate and summarize the current findings about this topic and, at the same time, provide the basic knowledge to understand the physics of the interactions between electromagnetic fields and biological systems. In the present work, after an introduction on the basic principles of MRI systems and the electric and magnetic properties of biological tissues, the basic principles needed to understand the bio-effects caused by the three main sources of electromagnetic fields utilized in MRI procedures are described. out of the direction of the static magnetic field; the time during which the magnetization vector returns to the equilibrium is different for each tissue, and this results in the two main imaging parameters, T1 and T2, which directly relate to the image contrast. These three fields are essential features of MRI procedures, and each interacts with the electromagnetic properties of biological tissues. The impedance of living tissue varies, depending on its dielectric permittivity and conductivity. Therefore, the value of the current and the attenuation of the electromagnetic field inside the tissue strongly depend on these two parameters. For biological tissues, both the dielectric permittivity and the conductivity are strongly non-linear functions of frequency. Moreover, if the frequency of an externally applied electromagnetic field changes, the interaction between the field and the tissue also changes. In particular, at low frequencies, electromagnetic fields interact at the cellular or multicellular level; as frequency progressively increases, bio-electromagnetic interactions occur with the cellular membrane and intracellular organelle, followed by molecular interaction and, finally, at microwave frequencies the field interacts only with water molecules . For these reasons, dielectric permittivity and conductivity show three principal behaviors, also called dispersions, depending on frequency. Figure 1 shows how permittivity and conductivity are strongly dependant on frequency  (the frequency range where electromagnetic waves are used in MR imaging is delineated). where μo is the magnetic permeability of vacuum. For most materials, the induced magnetic polarization is parallel to , in this case the materials are called "isotropic." Thus, χ is a scalar quantity, and vectors , and have the same direction. Materials may be classified into three large groups according to the values of their susceptibility: diamagnetic materials (-1 < χ < 0), paramagnetic materials (0 < χ < 0.01) and ferromagnetic materials (χ > 0.01). Figure 2 shows the spectrum of magnetic susceptibilities, demonstrating that the majority of human tissues is diamagnetic or weakly paramagnetic . The safety issues associated with exposure to static magnetic fields have been discussed for more than a century: in 1892 Peterson and Kennelly  studied the effects of the exposure to the largest magnet then available (approximately 0.15 T). They exposed a dog and a young boy to the whole-body magnetic field, finding no positive results. About 30 years later, in 1921, Drinker and Thompson  investigated possible health consequences of exposure to magnetic fields in industrial workers. They performed numerous experiments in vitro, on nerve-muscle cells, and in vivo, on living animals, and they concluded that the static magnetic field had no significance as a health hazard. Since then, several studies have been performed, and a review , published in 1962, collected about 400 reports dealing with biological effects of magnetic fields. According to Schenck , the portion of this literature dealing with supposed pathological or therapeutic effects of magnetic fields is contradictory and confusing. Moreover, basic information, such as the field strength and its variation over the body, is not provided. Interest in the biological effects of static magnetic fields has increased with the invention of MRI at the beginning of the 80s. In the last twenty years, several studies were carried out in order to understand the potential hazards associated with exposure to a strong static magnetic field. The majority of these studies did not report positive results, thus postulating no adverse effects for human health. In 1981, Budinger  summarized the work done previous to that date, concluding that from an analysis of the vast literature on cell cultures, animals, and men, no experimental protocol was found that, when repeated by other investigators, gave reproducible positive results. Twenty years later, Schenck  confirmed this and concluded his review stating that, because of the difficulty in establishing a negative conclusion, it should not be concluded that it has been proven that there are no significant biological effects of static magnetic fields. However, the steadily increasing capability to realize ever stronger magnets gives reason to believe that such effects could eventually be established, but probably at field strengths well above those currently utilized in MRI. In a relatively recent report , no adverse biological effects were found after sub-chronic (10 weeks) exposure to a very high magnetic field (9.4 T) in adult male and female rats and in their progeny. In the current literature, only some sensory effects have been found associated with exposure to a static magnetic field. There was a statistically significant (p < 0.05) finding for sensations of nausea, vertigo, and metallic taste in subjects exposed to 1.5 and 4 T static magnetic fields, but no statistical significance was found for other effects such as headache, hiccups, tinnitus, vomiting, and numbness. A higher incidence of positive reports originated from those subjects exposed to the 4 T field. However there was no evidence that these effects were at all harmful . Few studies have reported dangerous effects for human health, but such studies have neither been confirmed nor confuted by successive work. For instance, it was reported that the auditory evoked potentials of a subject exposed to a static 0.35 T magnetic field was phase-shifted ; the phase shift slowly (15 minutes) returned to normal after termination of the magnetic exposure. However, further studies did not confirm these findings [25, 26]. Research carried out by Pacini, et al. 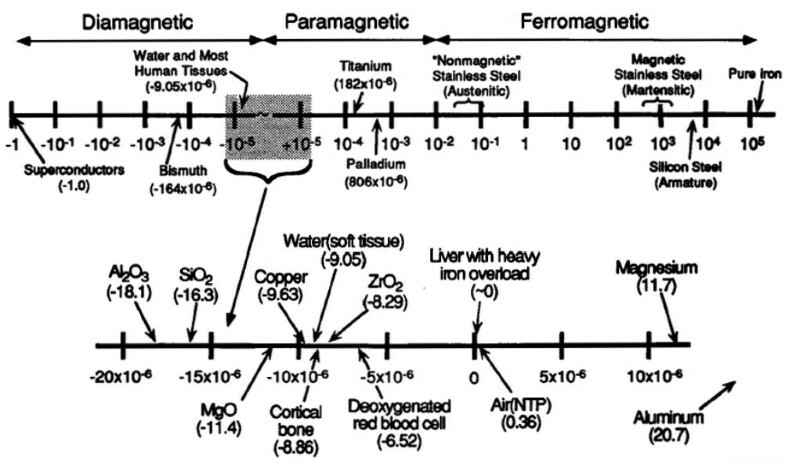 in 1999  described the effects of the static magnetic field generated by a 0.2 T magnetic resonance tomograph on a normal human neuronal cell culture. They observed that after 15 minutes exposure, cells showed dramatic changes of morphology, developing branched dendrites featuring synaptic buttons. Some modifications in the physiological functions of cells were also reported, but, here too, these findings have not yet been confirmed. We might conclude that, by examination of current literature and within the limits of our knowledge, the only health hazards to patients significantly associated with the exposure to static magnetic fields are related to the presence of ferromagnetic materials or cardiac pacemakers [28–30]. Although there is no evidence of health hazards associated with exposure of patients to strong static magnetic fields, we report here several physical mechanisms of interaction between tissues and static magnetic fields that could lead to potential pathological effects. can be seen as a motion-induced electric field, and it can produce biological effects by disrupting physiological electrical signals of the human body, such as neuronal conduction and biopotentials. It was reported  that ECGs of monkeys exposed to a strong static magnetic field showed field-induced morphological changes in T-wave shape. It was suggested that this might indicate a biological effect on the electric activity of the heart. However, afterwards, these changes were explained by the presence of the electromotive force (EMF) induced by blood flow in a static magnetic field, which is proportional to the quantity [32, 33]. The effects of EMF on the stimulation of nerve or muscle cells have recently been studied in humans at field strengths as high as 8 T . At the highest field strengths currently available, the flow-induced current densities are below the threshold levels needed to cause nerve or muscle stimulation effects, and no significant vital sign changes, e.g., ECG recordings, have been reported at these high field strengths . The metabolic functions of human tissues require a large quantity of chemical reactions, and it is therefore reasonable to suppose that a strong magnetic field might alter the rates or the equilibrium conditions of these reactions. For example, if the products of a chemical reaction are more paramagnetical than the reactants, the presence of a magnetic field could shift the reaction equilibrium to increase the concentration of the products. A very common and important chemical reaction in humans is the dissociation of oxyhemoglobin (diamagnetic) into separate molecules of oxygen and hemoglobin (both paramagnetic). In this case, an externally applied magnetic field could lower the energy barrier for the dissociation. Calculations indicate that, even in an applied field of 1 T, the free energy barrier to dissociation is changed by only 1 J/mol . Such a small energy shift has less effect on the reaction equilibrium than does a temperature change of 0.01°C. Another chemical effect of the static magnetic field consists of the modification of the kinetics and recombination of radical pairs reactions. Free radicals are supposed to be involved in harmful reactions in biological systems, thus any effect that might increase their reactivity or concentration could produce or enhance a harmful effect . From this observation, the radical pair mechanism has been proposed as a working hypothesis for possible adverse effects of magnetic fields on biological systems. In fact, according to the most accepted theory [38–40], the magnetic field splits the radical pairs into two energy levels, this increases the amount of radicals pairs that escape the recombination reaction , i.e., the concentration of free radicals. Experimental research has shown that weak magnetic fields may reduce the second-order decay rate constant of the reaction . Several studies analyzed the effects of magnetic fields on the recombination reaction of radical pairs in micelles and confirmed that an externally applied magnetic field increases the number of radicals escaping the recombination reaction [37, 39, 43]. However, few studies have been performed on biological tissues or on animals and humans. Claims that low magnetic fields damage health have led to extensive medical, chemical and physical research: though no firm evidence of hazards has emerged . , is applied to the moving ions. Although these forces principally act on flowing liquids, such as blood, research has shown there is no requirement for increased cardiac activity in order to maintain a constant cardiac output when an external magnetic field is applied to the body [45, 46]. On the other hand, a very small magneto- hydrodynamic force operating on the endolynphatic tissues of the inner ear may be the source for the sensations of nausea and vertigo sometimes reported at higher field strengths [23, 36]. These gradient-induced electric fields, at sufficiently high values, could stimulate nerves and muscles and, at very high levels could generate cardiac stimulation or even ventricular fibrillation . To help protect patients from these potential health hazards, several researchers have developed theoretical models and collected animal and human experimental data in order to formulate appropriate safety standards. In 1985, Bergeron  proposed an assessment of the threshold of peripheral nerve stimulation as a valuable indicator of high gradient-induced electric fields. According to this methodology, patients could be protected from gradient-induced ventricular fibrillation by not exceeding these thresholds. 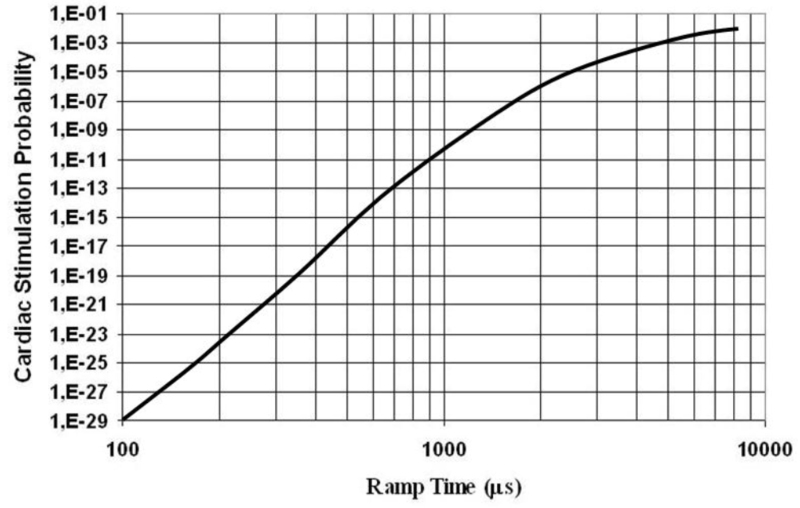 Reilly compared the values of the electric field obtained by his model with the experimental results reported in the literature and suggested that the best approximation for nerve stimulation threshold was an exponential curve. A better approximation might have been made using an hyperbolic form, which appears to be a better fit for more recent experimental data [52, 53]. Thus, it was estimated that the mean cardiac stimulation threshold was a factor of 2 above that of the most sensitive population percentile (1%), and the mean threshold for cardiac fibrillation was estimated to be another factor of 2.5 above the mean for cardiac stimulation. Figure 3 shows the mean thresholds for peripheral nerve and cardiac stimulation for the most sensitive population percentile. If the ramp duration of the time-variation of the magnetic fields is less than 1000 μs, the margin between nerve and cardiac thresholds is large, but if ramp duration exceeds a few milliseconds, the mean peripheral and the cardiac nerve stimulation thresholds approach each other . In addition to theoretical models, several studies in vivo have been performed to obtain gradient-induced stimulation thresholds in animals and in humans. Bourland, et al. [55–57] and Nyenhuis, et al. found strength-duration curves for gradient-induced nerve stimulation in dogs. These studies included both z and transverse gradient coils, with and without the presence of a 1.5 T static magnetic field. The lowest stimulation thresholds observed were for peripheral nerve, and at these thresholds muscle twitching also was observed. The stimulation thresholds found, were not significantly different at 0 T compared with 1.5 T exposure and, when corrected for pulse shape and pulse train length, appeared to agree roughly with the Reilly model  for the induced electric field required for stimulation. Bourland, et al. [55, 57] also found the mean threshold for magnetic stimulation of respiration and for gradient-induced cardiac stimulation in dogs. It was observed that stimulation thresholds for respiration were approximately three times the mean peripheral nerve stimulation thresholds, and that the cardiac stimulation thresholds were about nine times greater than the mean peripheral nerve thresholds for a ramp duration of 530 μs. In those studies they also reported that the energy stored in the gradient magnetic field required for the mean cardiac stimulation threshold in the dog at 530 μs is 80 times the energy required for the mean peripheral stimulation threshold. Recalling Reilly's estimate that the cardiac stimulation threshold for the most sensitive population percentile  is half the mean, and recognizing that the stored energy in the gradient magnetic field is proportional to the square of the magnetic field strength, thus, cardiac stimulation in the most sensitive population percentile should require 20 times the energy needed for the peripheral nerve stimulation mean. Finally, in these studies no significant differences were observed with or without a static magnetic field of 1.5 T, and whether cardiac stimulation experiments were done with blocked or beating hearts. In addition to the studies on animals, several investigators carried out gradient-induced stimulation experiments in humans: among them, Budinger , Cohen , Schaefer [61, 62], Bourland  and Ham . A review in 2000 by Schaefer, et al. collected the experimental data obtained in these studies and compared the different results reported. In figure 4 we show the experimental data points obtained for the z gradient, along with Reilly's estimate as a curve fit. Reilly's model fits experimental data in the 100–1000 μs range, which is currently typical of clinical MRI work. Also, the probability of cardiac stimulation assuming dB/dt levels at the mean peripheral nerve stimulation threshold was estimated . 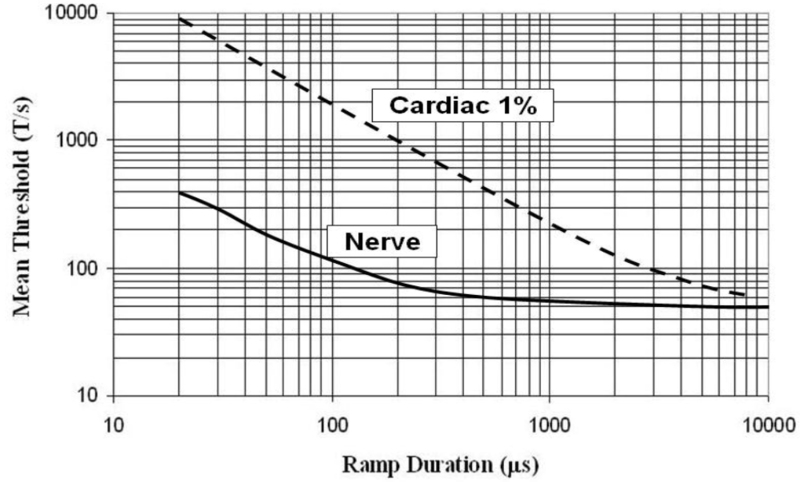 As shown in figure 5, for gradient ramp durations shorter than 1000 μs, the probability of cardiac stimulation in patients, at the peripheral nerve stimulation threshold, is very low (from 10-29 for 100 μs to 10-10 for 1000 μs). Thus, the stimulation probability increases with gradient ramp duration and, as the number of patients receiving MR scans annually approaches 107, it is important to maintain stimulation probabilities well below 1/107. From these findings, Schaefer. et al. proposed to protect patients with the safety standards (developed by the International Electrotechnical Commission) reported in table 1. Recently, a study found no significant correlation between gross anatomical measurements; such as age, weight, height, average body and fat percentage; and peripheral nerve stimulation . During an MRI exam, the patient is exposed to an electromagnetic radiation in the range of 8.5 to 340 MHz. This is known as the radiofrequency (RF) range of the electromagnetic radiation spectrum, and is nonionizing, that is to say the photons associated with this radiation frequency (wavelength) have insufficient energy to ionise the atoms of biological matter and hence possibly cause damage at the cellular level. For this reason, while ionizing radiation can cause discrete increases in the energy of a molecular or atomic absorber, causing irreversible alterations in atomic configurations, such as ionization or covalent bond disruption, nonionizing radiation (such as radiofrequency electromagnetic waves) cannot induce irreversible alterations in living systems via single-photon quantized molecular interactions, but only via multiphoton absorption, i.e. direct heating . Another distinction can be made between electromagnetic waves in the "far-field region" and electromagnetic waves in the "near-field region." In the first case, if the distance from the source of the electromagnetic radiation (L) is greater than the wavelength of the electromagnetic wave (λ), i.e. L >> λ, the electromagnetic radiation may be represented as a propagating wave consisting of transverse electric (E) and magnetic (H) fields, where the ratio between E and H is equal to the "wave impedance" in the medium (this is known as the plane-wave approximation). In the second case, if L is less than or equal to λ, it is possible to use the "quasi-static" approximation, and the electric and magnetic fields are effectively separable, meaning that the field from a particular source in the "near-field region" is either primarily electric (E >> H) or magnetic [15, 66, 67]. In an MRI examination, the patient is in the "near-field region," so biological effects of the radiofrequency electromagnetic waves are primarily caused by the magnetic field, with negligible contribution of the electric field . Non-thermal effects, which are due to an as yet unknown mechanism of direct magnetic field-tissue interaction . above 10 GHz, energy absorption occurs primarily at the body surface. It must be noted that electromagnetic waves normally utilized in MRI techniques are in the second range of absorption, at which high absorption occurs in the whole body. The dosimetric term utilized to describe the absorption of radiofrequency energy is the specific absorption rate (SAR), which it is normally measured in W/kg. 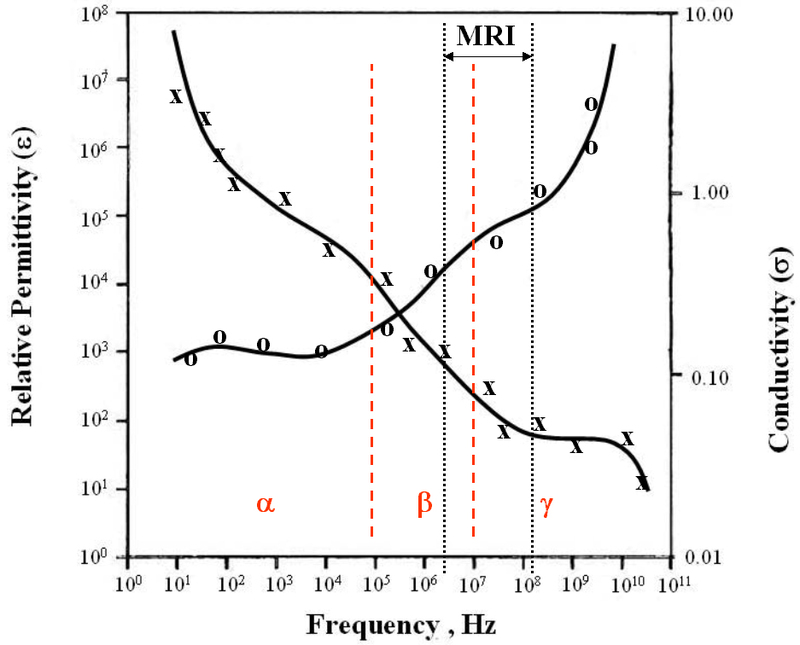 However, especially for human subjects, measurements or estimates of the SAR levels are not trivial, because body SAR during an MRI examination is a complex function of several variables, including the frequency, the type of RF pulse used and its repetition time, the configuration of the anatomical region exposed, and other factors [69–71]. Numerous studies carried out over the past 35 years have indicated that the exposure to radiofrequency radiation may produce various physiological effects, due to RF energy-induced heating in tissues, including those associated with alterations in visual, auditory, endocrine, neural, cardiovascular, immune, reproductive, and developmental functions . Several of these studies have been carried out on laboratory animals to determine thermoregulatory reactions of living systems to tissue heating associated with exposure to RF radiation. Nevertheless, these experiments do not apply directly to the conditions that occur during MRI procedures, because the pattern of RF absorption, or the coupling of radiation to biological tissues, depends on the body size, on the anatomical features, the duration of the exposure, the sensitivity of tissues, and several other factors. Therefore, the data obtained in experiments with animals cannot strictly predict thermoregulatory or other physiological changes in human subjects exposed to RF radiation during MR examinations [69, 72, 73]. In addition to experiments on animals, several models have been proposed to predict human responses to the RF energy that is absorbed by the body in MR procedures [74–76]. Though the major limitation of the proposed models is the difficulty to take into account the numerous critical variables that can affect the thermoregulatory responses of the human subjects (age, amount of subcutaneous fat, physical condition of the subject), more importantly, none of the models have ever been validated by experiments performed on humans . For the assessment of the actual thermal response during an MR procedure, it has been necessary to perform several experiments during which volunteers have been continuously monitored before, during, and after the MR examination. The main result of these experiments has been the individuation of some physiological parameters that have shown a significant response to a thermal load, such as sublingual or tympanic membrane temperature (good indicators of "deep body" or "core" temperature), skin temperature, heart rate, oxygen saturation, blood pressure, respiratory rate, and cutaneous blood flow; all these are important physiological variables that can change in response to a thermal load . The first experiment on human thermal response to RF radiation-induced heating during MR procedures was performed in 1985 by Schaefer . In this study, temperature changes and other physiological parameters were monitored in subjects exposed to relatively high whole-body average SARs (approximately 4.0 W/kg). The results showed that there were not excessive temperature elevations or other deleterious physiological consequences related to the exposure. Further studies were conducted on volunteers exposed to whole-body average SARs ranging from approximately 0.05 W/kg to 4.0 W/kg [78–84]. These experiments document that body temperature changes were always less than 0.6°C, though there were statistically significant increases in skin temperature, but without serious physiological consequences. Furthermore, there were no associated deleterious alterations in hemodynamic parameters, i.e. heart rate, blood pressure, and cutaneous blood flow. A recent study was carried out in order to determine if the heat induced in a head phantom of biological tissue by typical RF energy associated with an 8T MR system caused excessive temperature changes. The only noticeable effect found was an inhomogeneus RF distribution in ultra high field systems (> 4 T) . A study was carried out by exposing volunteers to an MRI procedure with a whole-body average SAR of 6.0 W/kg . This was the highest level of SAR that human subjects have ever been exposed to in an MRI procedure. This investigation was conducted in both cool (22°C) and warm (33°C) environments. The temperature of the tympanic membrane and skin, along with heart rate, blood pressure, oxygen saturation, and skin blood flow were monitored before, during, and after exposure to the RF electromagnetic energy. In the cool environment, there were statistically significant increases in the tympanic membrane, abdomen, upper arm, hand, and thigh temperatures, as well as skin blood flow. In the warm environment, there were statistically significant increases in tympanic membrane, hand and chest temperatures, as well as systolic blood pressure and heart rate. However, all the changes of the physiological parameters were within acceptable safe levels. This finding shows that an MR procedure with whole-body averaged SAR of 6.0 W/kg can be physiologically tolerated by a subject whose thermoregulatory function is not compromised [68, 86]. Finally, it is necessary to consider those organs that have reduced capabilities of heat dissipation and thus may be injured by elevated temperatures, such as gonads and eyes. Studies have demonstrated that RF radiation-induced heating may have detrimental effects on testicular functions if the scrotal or testicular tissue temperature exceeds 38°C . A study  measured the scrotal skin temperatures in volunteers exposed to an MRI procedure at whole-body averaged SAR of 1.1 W/kg. The largest increase in scrotal skin temperature was 2.1°C, and the highest scrotal skin temperature recorded was 34.2°C, i.e. below the threshold known to impair testicular function . With regard to heating of the eyes during an MR examination, corneal temperatures have been measured in patients exposed to a MRI of the brain with peak SARs up to 3.1 W/kg . The highest corneal temperature rise was 1.8°C, and the highest temperature measured was 34.4°C. Another study was carried out to examine corneal temperatures in patients with suspected ocular pathology, exposing the subjects to peak SARs ranging from 3.3 to 8.4 W/kg . The highest corneal temperature measured in this investigation was 35.1°C. As temperatures measured in these studies were below recognized safety thresholds, it does not appear that clinical MR procedures have the potential to cause thermal damage to ocular tissue . Finally, we should notice the lack in the current literature of studies concerning patients with conditions that impair heat dissipation. RF radiation may also cause non-thermal, field-specific changes in biological systems, that are produced without an elevation in temperature. however, non-thermal effects of RF electromagnetic waves are not well understood and, above all, have not been studied in association with the use of MR system . Those interested in a thorough discussion of this topic are referred to the extensive review by Beers . Here we will limit ourselves to report some qualitative considerations arising from the ever increasing importance of the subject . Undoubtedly, in human beings electromagnetic fields play a crucial role in controlling and maintaining orderly physiological functions. Thus, a living system is an electromagnetic instrument of great sensitivity; because in the relatively short time for which humanity has been exposed to man-made electromagnetic waves, there is no evidence of evolutionary immunity against any adverse effects this radiation might have. Whereas the thermal effects arise from a transfer of energy between the external fields and the human tissues, the non thermal effects could arise from a "transfer of information" from the field to the living system. (A good example of the transfer of information from the electromagnetic field to a living system is the ability of a flashing light, at a certain rate, to trigger seizures in people suffering from photosensitive epilepsy; this effect is due, not to the brightness of the light, but rather to the frequency of the flash.) This type of interaction might be strongly non-linear and dependent on the frequency of the external electromagnetic field. Nevertheless, the ICNIRP Safety Guidelines  permit humans to be exposed to electric fields that are over ten times stronger than radiation limits applicable to all electronic consumer products presently on the market. Perhaps the safest component of the MRI exam is the static magnetic field. By examination of the current literature, and within the limits of our knowledge, the only health hazards significantly associated with the exposure to static magnetic fields are related to the presence of ferromagnetic materials or cardiac pacemakers in patients. Almost all of the more than 100 million MRI exams performed since early 1980 were completed without any evidence of harmful effects to the patient from the static magnetic field. However, due to the signal to noise advantages of high field MRI systems, increases in the static magnetic field are inevitable. The second potential source of risk in MRI exams arises from the use of pulsed field gradients. High slew rates can cause peripheral nerve and/or cardiac stimulation to the patient. However, peripheral nerve stimulation, which can be painful although not harmful to the subject, has a threshold lower than the level required for potentially dangerous cardiac stimulation. Present day MR systems typically operate below nerve stimulation levels thus, at the current state of the art, cardiac stimulation is very unlikely. RF power deposition represents the greatest risk for patient safety in MRI exams. There is widespread agreement among scientists in considering that a local increase in temperature of 1°C in a healthy individual is absolutely free of risk. In MRI exams, an SAR of 8 W/kg could be used, but for short enough exposures so as not to produce a more than 1°C core body temperature rise. However, in terms of safety, it would be desirable that a clinical MR system be equipped with a sensing phantom that could shut off the power to the RF source when SAR levels approach the limits established by international safety guidelines. From these considerations, our hope is that the knowledge of magnetic resonance imaging systems safety can not only help guide the future design of these instruments, but also affect the selection of procedures in order to ensure safe, efficacious, and efficient system operation. DF collected, organized and reviewed the literature. SS conceived of the study and reviewed the literature.